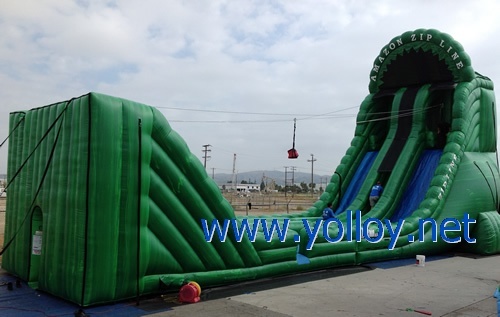 the inflatable zip line is an all new "wow" game for school, city and church events. players will zip from the 36 foot start to a safe and soft landing.. The inflatable structure makes the whole zip line to be the safest zip rider game. The riders are protected by the total inflated walls from the entry into the ride until the zip ride is completed. And if you do not want to zip down, but you have get up to the top, you can slide down the slide, so this is another way to enjoy the whole zip line.